Farley's life has its ups and downs. He has really good friends in Josh and Burt, even though they have a tendency to call him "Fartley". His parents are supportive, but his father was the sort of popular, athletic kid that Farley definitely is not, so Farley thinks he disappoints him. It's summer vacation, and the big news is that one of Farley's old friends has moved back to town near Burt's house and is eager to get back together. The bad news is that it's Anna, who shared Farley's love of comics and was super cool, and Farley does not feel ready to meet her. He decides to use the summer for self improvement, and even clicks on some internet links to help him with his project. The lights flicker, his computer starts acting strangely, and a tiny, doll-sized surfer dude named Tomy materializes in his bedroom and starts to give him advice! Always worried that his parents will find his new friend hiding out in the Sea Monkey aquarium or in the hammock he has made of Farley's underwear, Farley nevertheless embarks on his program to improve himself. He tries to eat healthier foods, goes running with his father, and generally tries to organize himself a bit more. Sadly, he is not able to avoid Anna during the summer, but the two still are friendly, and Anna remains as cool as ever, even joining the band that Farley has put together with his friends. As the bands first gig approaches, Farley starts to realize that Anna may actually like him for himself, even though working through some issues with Tomy hasn't been a bad idea. Strengths:The biggest concern for middle school students is personal identity. Who am I? What do people think of me? What activities can I do that will define me as the person I want the world to see? Farley's struggle to move beyond the first version of himself is one that readers will find relatable, and the fact that it is treated with humor gives a great perspective. If you can't laugh at yourself in middle school, life is going to be very hard, and Farley is a well-balanced character with understandable flaws as well as reasonable expectations. He also typifies the goofiness and lack of forethought that I see every day in middle school. Anna is a great character, and their relationship is very sweet. Gangsei writes especially excellent parents in her first book, The Wild Bunch, as well as in this. They are just involved enough to be annoying, but are also present in a pinch. Weaknesses: Will today's readers understand the term "2.0"? We don't seem to have versions on things anymore, since everything is version 36 or so. The only problem I had with the writing was that on the same page Farley is complaining to Anna that his friends don't seem the real him, they just think he is the clown he sometimes pretends to be, he mentions that the gym workers must be required to be muscle bound and tank top clad. Maybe Rob has a PhD in nuclear physics, and Farley relies on outward appearances to judge inner character as much as his friends. I was hoping this interchange would go somewhere meaningful, but it didn't. Will students notice this? Not at all. What I really think: Definitely purchasing, and this cover will sell the book immediately. I love the stripes on the sides of the MAX books-- makes them easy to pick out if they ever make it back to the shelves. 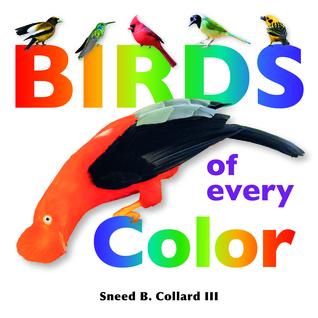 This innovative nonfiction picture book for older elementary students discusses the purpose and story behind the different colors of birds. It starts with beautiful spreads on a few different colors, with a discussion of a particular bird with that color, and why that color is significant. It then explains how birds' colors are developed, with complete scientific explanations, with new terms explained and pronounced. My favorite part was the delineation of what different colors SAY to other birds! I did not know that birds with blacker caps and whiter whites on their faces became the rulers of their flocks! At the end of the book, there is a nice layout of different birds, as well as a glossary of terms used. Like all of Collard's books, the photography is exquisite, and the research well done. This would be a great baby gift, since it's the sort of book that grows with a child's increasing understanding; babies will enjoy pointing out the colors of the birds, but older children will find the science fascinating. Both books are new to me and both sound good, Karen. Thanks! Love the themes running through 2.0. I will be tracking down a copy to add to my summer reading list. Only six weeks to go! I've been curious about Project Me 2.0. That cover is quite attractive and caught my attention right away, but you have a good point on the 2.0 thing. With iPhones it's 5c, 5s, 6, 7, 7 plus, 8, etc. So hopefully they'll get a little context before hand. I appreciate your shares and hope you have a wonderful week, Karen! I did a search of my library for Birds of Every Color, and got Ultimate Petula Clark. Go figure. I guess they do not have it yet. 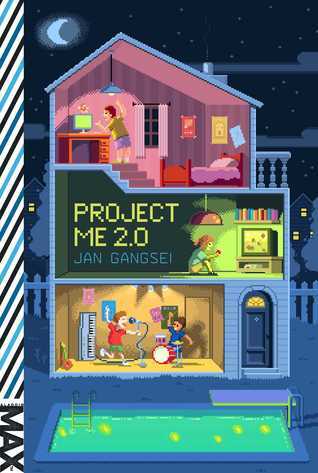 Project Me 2.0 looks like an interesting read. I wonder why they added that 2.0 anyway? Both of these sound like books I would like, especially Birds of Every Color. I tried to find it at my library and my search brought up The Secret Garden. That's not any closer than Cheriee's search. Thanks for your reviews of these books. I agree with your comment about 2.0 it must be hard for writers to consider making tech references or not as they become dated so quickly. I am on the fence with that book. Birds of Every Colour looks good. Thanks for the shares.